A single U.S. bank failed on Friday December 14. Following are the banks that have failed thus far in 2012. Estimated cost to the FDIC Deposit Insurance Fund in parentheses. This page last updated on December 15, 2012. Eric Thompson is shameless—TGSCOM Inc.: The go-to firearms dealer for mass murderers? Cowboys Stadium video board fail—Last night Tennessee Titans punter A.J. Trapasso exposed a significant flaw in the design of Cowboys Stadium. 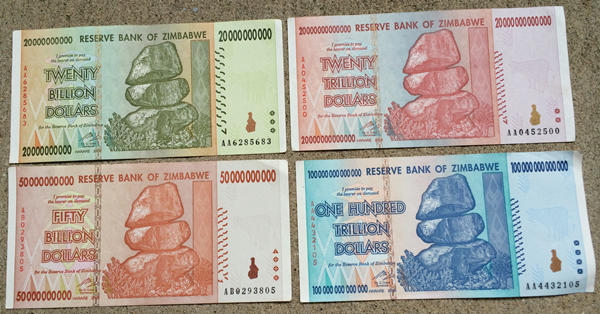 Zimbabwean Dollars for Sale—You can buy a Zimbabwean one hundred trillion dollar bill on the street in Zimbabwe for five American dollars. NJ Nets End Season-Long 18-Game Losing Streak—The New Jersey Nets defeated the Charlotte Bobcats on Friday night, ending the club’s season-long losing streak at 18 games.